The 2013 Ram 1500’s new 3.6-liter engine is turning heads not for its fuel efficiency or relative lack of power (after all, we are talking about a work pickup), but rather for how much space its small size leaves free under its hood. Made to hold Chrysler’s 5.7-liter Hemi V-8, the 2013 Ram 1500’s engine bay is roomy enough to handle the new engine, one of Chrysler’s smallest engines, along with a mechanic standing firmly inside it, her feet flat on the ground. 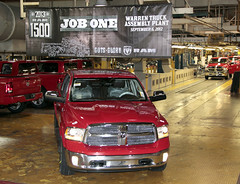 Chrysler recently had their best June in years; however, it remains to be seen just how popular this diminutive power plant will be to the traditional pickup buyer. ← Does Anyone Care that the 2013 Honda Accord is Here?